Playable in low graphics mode, not bad really. Completely unresponsive above that. Some strange graphical artifacts in the launcher during install. Edited by lenticular, Apr 03 2014 - 03:52. 33 fps and 130 ping. When playing arty I cannot use ctrl+right click to move targeting on map quickly. Also, it needs a windowed fullscreen mode so I can access a browser between battles to research enemy tanks. LOVE IT!! I dropped the track effects, water quality, motion blur, and effects in sniper mode to as low as I could, but everything else on max and I hit around 30 fps! love it guys! Edited by dstud208, Apr 03 2014 - 18:49. DEFINITELY telling my brother about this so he can get off that crappy wrapper he is using too! 30 FPS on MAXIMUM SETTINGS!!! Wahoo!!! You guys with dual gfx cards, make your you not on which card you were getting those frames on. The text at the bottom of the launcher where it shows progress of the download/update status is off slightly. So far mine has been sitting on a blank "recieving updates" for about 2 hours. 03/04/2014 19:06:26 Start "WOTLauncher.exe" params="C:/Games/World_of_Tanks/WOTLauncher.exe"
03/04/2014 19:06:26 Replace "7z.dll".update with "7z.dll"
03/04/2014 19:06:26 Create update folder: path="C:\Games\World_of_Tanks\Updates"
03/04/2014 19:06:26 Try access patch folder: path="C:\Games\World_of_Tanks\Updates"
03/04/2014 19:06:26 Create temp folder: path="C:\users\crossover\Temp\wargaming.net\wot\temp"
03/04/2014 19:06:26 Try access temp folder: path="C:\users\crossover\Temp\wargaming.net\wot\temp"
03/04/2014 19:06:26 Save configuration: path="C:\Games\World_of_Tanks\WOTLauncher.cfg"
03/04/2014 19:06:27 send http request. url: "http://update.worldo...tocol_ver=3〈=en"
03/04/2014 19:06:28 http request complete. 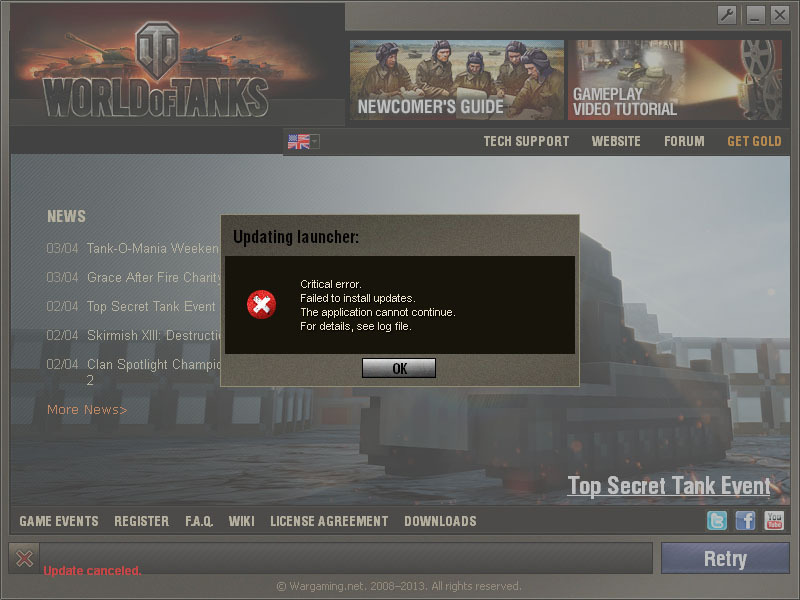 03/04/2014 19:06:28 ERROR: move file: "C:\users\crossover\Temp\wargaming.net\wot\temp\wot_8B.269_launcher.patch\WOTLauncher.cfg.update" to "C:\Games\World_of_Tanks\WOTLauncher.cfg.update"
03/04/2014 19:06:29 ERROR: patch installation. name: "wot_8B.269_launcher.patch", what: move file error, msg: name="C:\users\crossover\Temp\wargaming.net\wot\temp\wot_8B.269_launcher.patch\WOTLauncher.cfg.update" name_to="C:\Games\World_of_Tanks\WOTLauncher.cfg.update"
I don't expect flawless since it is 7 years old machine that is retired for year now. Edited by death666grim, Apr 03 2014 - 18:53. Are you moving the launcher to your applications folder? If you are trying to launch it from the disk image it won't work. My brother was trying to do that. When you double click the dmg file you download it should give you a window that has the launcher sitting next to a folder. Drag the launcher to the folder BEFORE you try to run it. Then close that window, open a new one, go to your applications folder (It will be there) and then run it. Just curious, but is this wrapper for NA only and if so will other servers be supported? I'm happy to do NA as that's where I do the bulk of my tanking, but as an Aussie I also have an SEA account. Right now the wrapper defaults to the NA server group. We are currently doing the initial testing in the NA region. Testing and/or release may expand out to all regions in the future, but if/when that will happen I don't personally know. This is a known issue with the wrapper. I've experienced it on every Mac I have ran it on. Thank you for the report, though! First, as dstud208 said, make sure the application is in the Applications folder. If this persists, try deleting the WOTLauncher.cfg.update file from Documents/World_of_Tanks, if it exists. If this still persists, delete the whole World_of_Tanks folder from your Documents and run the wrapper again. It will put a clean World_of_Tanks folder in your Documents. 03/04/2014 15:04:00 Start "WOTLauncher.exe" params="C:\Games\World_of_Tanks\WOTLauncher.exe -restart"
03/04/2014 15:04:00 Create update folder: path="C:\Games\World_of_Tanks\Updates"
03/04/2014 15:04:00 Try access patch folder: path="C:\Games\World_of_Tanks\Updates"
03/04/2014 15:04:00 Save configuration: path="C:\Games\World_of_Tanks\WOTLauncher.cfg"
03/04/2014 15:04:01 send http request. url: "http://update.worldo...890AFD80709〈=en"
03/04/2014 15:04:01 http request complete. 03/04/2014 15:04:01 send http request. url: "http://update.worldo...5601890AFD80709"
03/04/2014 15:04:01 send http request(attempt: 1). url: "http://specialdelive...t.patch.torrent"
03/04/2014 15:05:04 WARNING: http request failed. what: http request error msg: Inner libCurl error(28): "Timeout was reached". 03/04/2014 15:05:04 send http request(attempt: 2). url: "http://specialdelive...t.patch.torrent"
03/04/2014 15:06:04 WARNING: http request failed. what: http request error msg: Inner libCurl error(28): "Timeout was reached". 03/04/2014 15:06:04 send http request(attempt: 3). url: "http://specialdelive...t.patch.torrent"
it seems like the server is not responding to my http requests to download, is the server down right now? Someone help me!!! I want to play on Mac sooooooo bad! EDIT: IT IS DOWNLOADING!! I disabled torrent downloads in the options menu (wrench icon). The Game Refuses to Start up Properly, it just keeps crashing. What point do you reach? Does it start downloading? Did it finish downloading and just won't run? Or does it just not launch at all, ever? Music stutter at low, med and high settings. Game stutter during an intense firefight at low setting, between 6 and 9 tanks on screen firing at once at the time. Rendered it almost unplayable during the stutter. Turning off music and playing on high has the occasional "skip" but it's playable. Should be good when it's tweaked a bit.